Kids will love scooting around playtime with Barbie doll because when a girl plays with Barbie, she imagines everything she can become! Barbie doll has knees that bend for a comfortable ride - snap her waist into the clip on the seat and her place her hands within the clips on the handlebars to help hold her in place for active storytelling. The wheels really roll -- simply lift up the silvery kickstand and push to get a story started! 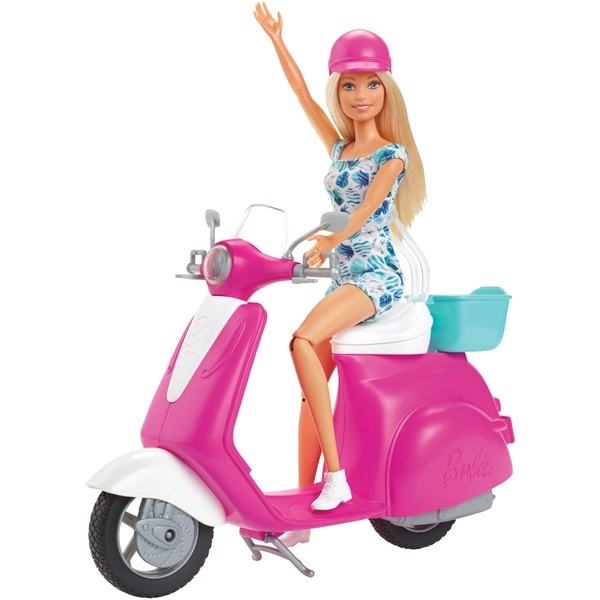 Barbie doll encourages imaginations to explore the world with a cool pink and white scooter that has a teal basket on the back! Barbie doll gets playtime rolling with a scooter designed to spark imaginations! The pink and white vehicle has a kickstand, a basket on back and wheels that roll -- just push to get the action started. A clip on the seat and handles on the handlebars hold Barbie doll in place for active storytelling, and a pink helmet keeps her safe while riding. Kids will have so much fun exploring the world with Barbie doll and her scooter because when a girl plays with Barbie, she imagines everything she can become! Includes Barbie doll wearing fashion and accessories and scooter with basket and rolling wheels, plus helmet. Doll cannot walk or ride alone.